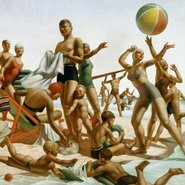 Join a lively discussion focused on iconic Australian artworks inspired by summer. Share how these works compare to your own memories and experiences and reflect on how you would you describe the experience of an Australian summer. Image: Charles Meere Australian beach pattern 1940 © Charles Meere Estate. Licensed by Viscopy, Sydney.